Hi everyone! I am just about on my last week of my Whole30, which is hard to believe. It went so fast! I have so been enjoying eating three, full meals a day and varying up the same boring recipes I normally make over and over again. I swear I develop more recipes when I’m doing a Whole30 than I do at any other time. This Whole30 Caesar Salad is something I’m really excited about. It’s extremely simple to prepare and if you’re like me and get sick of eggs for breakfast when doing a Whole30, this salad can be enjoyed for breakfast, lunch or dinner. I’ve totally had it for all three and love it each time! 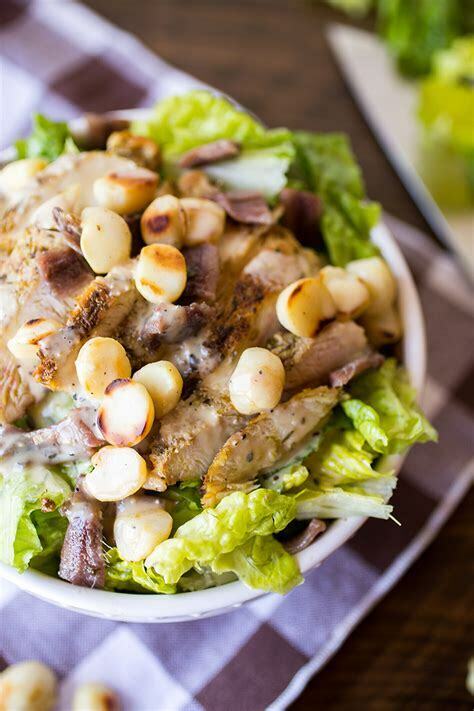 Caesar salad normally has cheese and croutons (both definite no-nos on a Whole30), but since I use Primal Kitchen Caesar Dressing and macadamia nuts instead of croutons, we’re good to go! This new dressing from Primal Kitchen is so unbelievably good. I go through far to many bottles of this on a regular basis. What I love to do to make this salad easier is grill up a few chicken breasts at a time to have on hand. That way, when it’s time to throw this salad together, it only takes a couple of minutes! Once chicken has been rinsed and sliced or pounded thin, heat up a cast iron skillet on medium high heat. While the pan is heating, season the chicken with Garlic & Herb seasoning. Add avocado oil to the pan and allow to heat for a couple minutes. Add the chicken, cooking on both sides for about 3 minutes each side or until nice and golden brown. Add the broken pieces of romaine into a bowl. Slice anchovies and place on top of the lettuce. Carefully remove any excess oil from the pan you cooked the chicken in and toast the macadamias until just nicely browned and remove. Slice the chicken and add to the top of the romaine and anchovies, followed by the dressing and macadamias. Yum!! 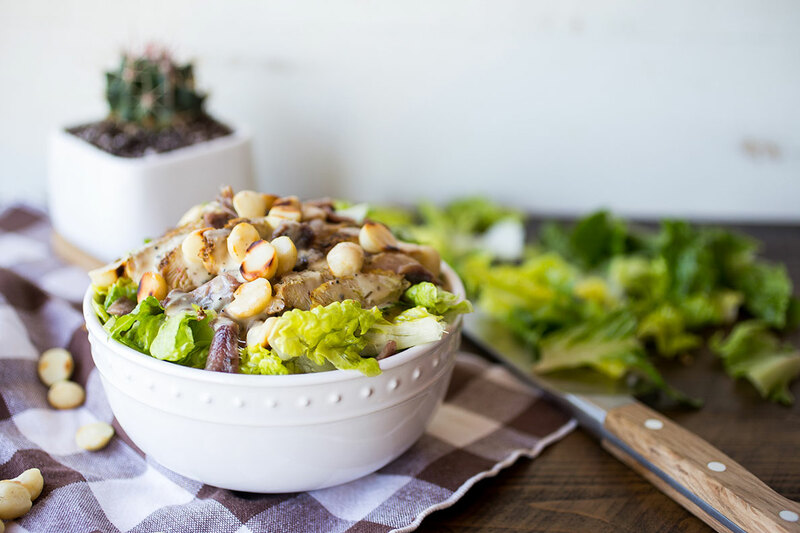 I love a good Caesar salad and I love that this is Whole 30-compliant. Great idea to add macadamia nuts, too!